Ezra Cornell: "To the poor and to posterity"
The creation of Western Union had made Ezra Cornell a wealthy man, with an annual income of $140,000. He wrote in his old Cyphering Book: "My greatest care now is how to spend this large income to do the greatest good to those who are properly dependent on me, to the poor and to posterity." Cornell had always been generous, so long as the cause embraced his own values of education and honest hard work. His personal philanthropies were numerous, and he often made small grants to individuals. During the Civil War, he was active in local and state war-relief activities, heading the Ithaca relief committees. For Cornell, however, the greatest good was always education. In 1858, he had been instrumental in founding an Agricultural Reading Room, personally purchasing books and subscribing to journals. He took an active part in creating the New York State Agricultural College at Ovid, and served on its board of trustees. In 1863, he built and endowed a public library for Ithaca and Tompkins County, with space for 30,000 volumes, rooms for the Farmers' Club and Museum, and a place for the new Tompkins County Historical Society which he also was helping to organize. He also supported Dr. Samantha Nivison's proposed establishment of Cascadilla Place, a water cure sanitarium and school for the education of women doctors and nurses. Both charters would come to the attention of the New York State Senate's Committee on Literature, a committee chaired by Andrew Dickson White of Syracuse. On his trip to Europe, Cornell visited Oxford and several continental universities. Soon after, on the inside cover of his 1863 pocket diary he jotted: "Enquire what the effect of large endowments are upon colleges. How many graduates do they send out, etc." 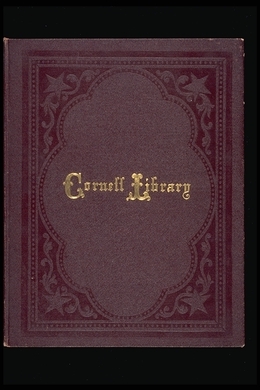 After 1865, Cornell University became the primary focus of his philanthropy. Received of E. Cornell seventy three dollars for support of families of Colored Volunteers of Albany County for 54th Mass. Regt. Wilbur F. Crummer to Ezra Cornell. Pleasant Valley, Jo Daviss County, Illinois. October 28, 1864. Autograph letter signed, with list of books sent by Cornell. I see you have given $50,000 for a public Library to be formed in Ithica N.Y. now can you give a poor wounded invalid soldier, who is closely confined to the house, some few books or magazines to read through the coming winter? I love to read, but am to poor to buy the works I should like to read. The hours pass off slowly when I have nothing to read...the smallest favor will be thankfully received. An Institution for the Treatment of the Sick, and the Education of Females and Physicians and Nurses. Address by Miss S.S. Nivison. 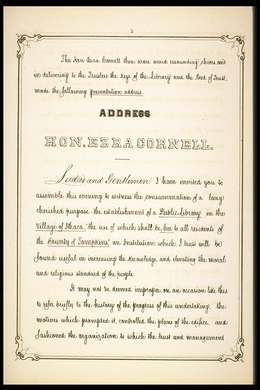 Charter and Explanatory Remarks. Ithaca, N.Y.
Ezra Cornell to Francis M. Finch, January 13, 1864. I have five children, it would not benefit them to give them more than $100,000 each, thus less than half is disposed of....The Library will probably absorb $60,000, but supposing it to go to $75,000. What shall I do with the balance? I hope to do much good with it, but I really don't know how to dispose of it in a will so as to do the good with it that I should desire to do. 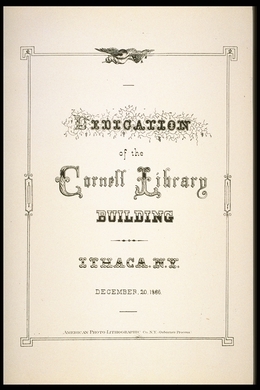 Dedication of the Cornell Library Building. Ithaca. N.Y. December 20, 1866. N.Y.: American Photo-Lithographic Co.
Ezra Cornell to R.R. Williams, Chief Engineer, Fire Dept., December 18, 1868. Autograph letter signed. I also deeply simpathise with them in the hardships and vexation arising from the false alarm of the other evening which called them forth at midnight, and regret exceedingly that the folly of thoughtless youth should thus multiply their labors.... Please accept the enclosed hundred dollars for the firemen of Ithaca as a small token of my regard.